Other means of : Not available. The following recommendations for exposure controls and personal protection are intended for the manufacture, formulation and packaging of this product. For applications and/or use, consult the product label. The label directions supersede the text of this Safety Data Sheet for application and/or use. Hazard statements : H332 – Harmful if inhaled. H411 – Toxic to aquatic life with long lasting effects. Prevention : P271 – Use only outdoors or in a well-ventilated area. P273 – Avoid accidental release to the environment. P261 – Avoid breathing vapor. Response : P391 – Collect spillage. for breathing. Call a POISON CENTER or physician if you feel unwell. Disposal: P501 – Dispose of contents and container in accordance with all local, regional, national and international regulations. Mixture Other means of: Not available. Inhalation : Harmful if inhaled. The exposed person may need to be kept under medical surveillance for 48 hours. : Use an extinguishing agent suitable for the surrounding fire. Unsuitable extinguishing : None known. decomposition products carbon dioxide carbon monoxide nitrogen oxides halogenated compounds Special protective actions : No special measures are required. For fire-fighters Special protective : Fire-fighters should wear appropriate protective equipment and self-contained breathing equipment for fire-fighters apparatus (SCBA) with a full face-piece operated in positive pressure mode. No action shall be taken involving any personal risk or without suitable training. Keep personnel unnecessary and unprotected personnel from entering. Do not touch or walk through spilled material. Avoid breathing vapor or mist. Provide adequate ventilation. Wear appropriate respirator when ventilation is inadequate. Put on appropriate personal protective equipment. For emergency responders : If specialized clothing is required to deal with the spillage, take note of any information in Section 8 on suitable and unsuitable materials. See also the information in “For non-emergency personnel”. Environmental precautions : Avoid dispersal of spilled material and runoff and contact with soil, waterways, drains and sewers. Inform the relevant authorities if the product has caused environmental pollution (sewers, waterways, soil or air). May be harmful to the environment if accidentally released in large quantities. Collect spillage. : Stop leak if without risk. Move containers from spill area. Approach release from upwind. Prevent entry into sewers, water courses, basements or confined areas. Wash spillages into an effluent treatment plant or proceed as follows. Contain and collect spillage with non-combustible, absorbent material e.g. sand, earth, vermiculite or diatomaceous earth and place in container for disposal according to local regulations (see Section 13). Dispose of via a licensed waste disposal contractor. Contaminated absorbent material may pose the same hazard as the spilled product. Note: see Section 1 for emergency contact information and Section 13 for waste disposal. : Put on appropriate personal protective equipment (see Section 8). Do not ingest. Avoid contact with eyes, skin and clothing. Avoid breathing vapor or mist. Avoid accidental release to the environment. Keep in the original container or an approved alternative made from a compatible material, kept tightly closed when not in use. Empty containers retain product residue and can be hazardous. Do not reuse container. : Eating, drinking and smoking should be prohibited in areas where this material is handled, stored and processed. Workers should wash hands and face before eating, drinking and smoking. 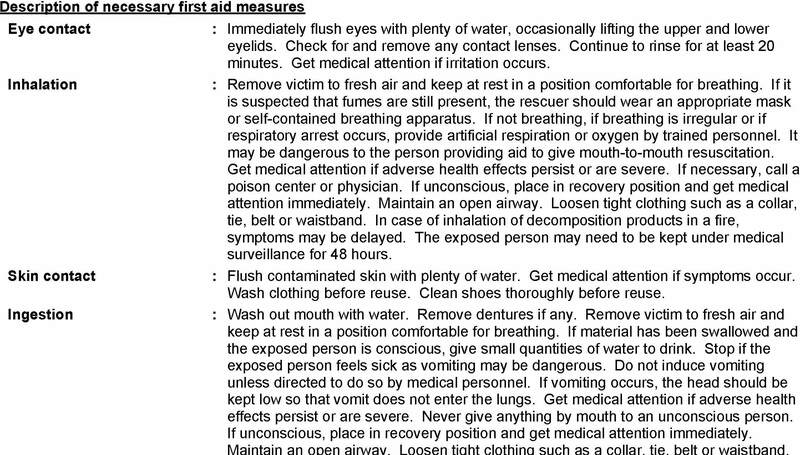 See also Section 8 for additional information on hygiene measures. : Store in accordance with local regulations. Store in original container protected from direct sunlight in a dry, cool and well-ventilated area, away from incompatible materials (see Section 10) and food and drink. Keep container tightly closed and sealed until ready for use. Containers that have been opened must be carefully resealed and kept upright to prevent leakage. Do not store in unlabeled containers. Use appropriate containment to avoid environmental contamination. Appropriate engineering : Use only with adequate ventilation. Use process enclosures, local exhaust ventilation or controls other engineering controls to keep worker exposure to airborne contaminants below any recommended or statutory limits. controls they comply with the requirements of environmental protection legislation. : Wash hands, forearms and face thoroughly after handling chemical products, before eating, smoking and using the lavatory and at the end of the working period. Appropriate techniques should be used to remove potentially contaminated clothing. Wash contaminated clothing before reusing. Ensure that eyewash stations and safety showers are close to the workstation location. Eye/face protection : Safety eyewear complying with an approved standard should be used when a risk assessment indicates this is necessary to avoid exposure to liquid splashes, mists, gases or dusts. If contact is possible, the following protection should be worn, unless the assessment indicates a higher degree of protection: safety glasses with side-shields. : Chemical-resistant, impervious gloves complying with an approved standard should be worn at all times when handling chemical products if a risk assessment indicates this is necessary. Considering the parameters specified by the glove manufacturer, check during use that the gloves are still retaining their protective properties. It should be noted that the time to breakthrough for any glove material may be different for different glove manufacturers. In the case of mixtures, consisting of several substances, the protection time of the gloves cannot be accurately estimated. Body protection : Personal protective equipment for the body should be selected based on the task being performed and the risks involved and should be approved by a specialist before handling this product. Color : Off-white to tannish-gray. Odor threshold : Not available. Melting point : Not available. Evaporation rate : Not available. Lower and upper explosive : Not available. Solubility : Easily soluble in the following materials: cold water and hot water. Partition coefficient: n : Not available. Auto-ignition temperature : Not available. Possibility of hazardous : Under normal conditions of storage and use, hazardous reactions will not occur. Reactive or incompatible with the following materials: oxidizing materials. Hazardous decomposition : Under normal conditions of storage and use, hazardous decomposition products should products not be produced. : No known significant effects or critical hazards. : No known significant effects or critical hazards. : No known significant effects or critical hazards. : No known significant effects or critical hazards. : No known significant effects or critical hazards. 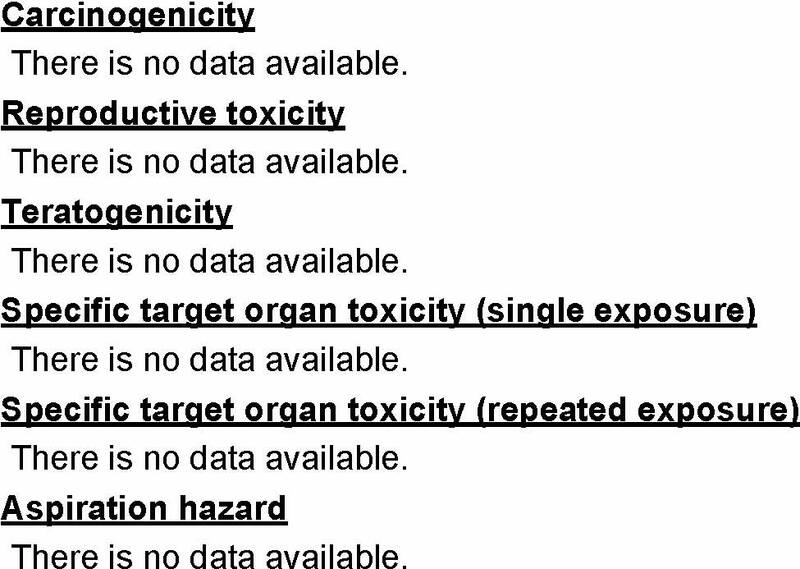 No known significant effects or critical hazards. : No known significant effects or critical hazards. : No known significant effects or critical hazards. : No known significant effects or critical hazards. : No known significant effects or critical hazards. : No known significant effects or critical hazards. Soil/water partition : Not available. : The generation of waste should be avoided or minimized wherever possible. Disposal of this product, solutions and any by-products should comply with the requirements of environmental protection and waste disposal legislation and any regional local authority requirements. Dispose of surplus and non-recyclable products via a licensed waste disposal contractor. Waste should not be disposed of untreated to the sewer unless fully compliant with the requirements of all authorities with jurisdiction. Waste packaging should be recycled. Incineration or landfill should only be considered when recycling is not feasible. This material and its container must be disposed of in a safe way. Care should be taken when handling empty containers that have not been cleaned or rinsed out. Empty containers or liners may retain some product residues. Avoid dispersal of spilled material and runoff and contact with soil, waterways, drains and sewers. Environmental hazards No. Yes. Yes. Additional information – This product is not regulated as a dangerous good when transported in sizes of ?5 L or ?5 kg, provided the packagings meet the general provisions of 4.1.1.1, 4.1.1.2 and 4.1.1.4 to 4.1.1.8. This product is not regulated as a dangerous good when transported in sizes of ?5 L or ?5 kg, provided the packagings meet the general provisions of 5.0.2.4.1, 5.0.2.6.1.1 and 5.0.2.8. Special precautions for user : Transport within user’s premises: always transport in closed containers that are upright and secure. Ensure that persons transporting the product know what to do in the event of an accident or spillage. Fluridone 42 No. No. No. Yes. No. Proprietary ingredient 2 1 – 5 No. No. No. Yes. No. : None of the components are listed. Caution: HMIS® ratings are based on a 0-4 rating scale, with 0 representing minimal hazards or risks, and 4 representing significant hazards or risks Although HMIS® ratings are not required on SDSs under 29 CFR 1910.1200, the preparer may choose to provide them. HMIS® ratings are to be used with a fully implemented HMIS® program. HMIS® is a registered mark of the National Paint & Coatings Association (NPCA). HMIS® materials may be purchased exclusively from J. J. Keller (800) 327-6868. Reprinted with permission from NFPA 704-2001, Identification of the Hazards of Materials for Emergency Response Copyright ©1997, National Fire Protection Association, Quincy, MA 02269. This reprinted material is not the complete and official position of the National Fire Protection Association, on the referenced subject which is represented only by the standard in its entirety. Copyright ©2001, National Fire Protection Association, Quincy, MA 02269. This warning system is intended to be interpreted and applied only by properly trained individuals to identify fire, health and reactivity hazards of chemicals. The user is referred to certain limited number of chemicals with recommended classifications in NFPA 49 and NFPA 325, which would be used as a guideline only. Whether the chemicals are classified by NFPA or not, anyone using the 704 systems to classify chemicals does so at their own risk. Revised Section(s) : 1, 2, 3, 4, 5, 6, 7, 8, 9, 10, 11, 12, 13, 14, 15, 16. Notice to reader To the best of our knowledge, the information contained herein is accurate. However, neither the above-named supplier, nor any of its subsidiaries, assumes any liability whatsoever for the accuracy or completeness of the information contained herein. Final determination of suitability of any material is the sole responsibility of the user. All materials may present unknown hazards and should be used with caution. Although certain hazards are described herein, we cannot guarantee that these are the only hazards that exist.